Yes, you only need 1,000 words, but have you ever thought about what that really means? And how do you know if you really know a word? And if you do know 1,000 of them, are you able to say whatever you want? Let’s take a few examples, and see what’s really involved. These are obviously essential words, but if you started Spanish by learning these, there wouldn’t be very much you could say just yet. All of these words are functional words – they are the glue that holds sentences together. It’s clear that to really know these words and be able to use them properly, you have to understand the grammar behind them. It’s not enough just to learn the words, parrot style! So, we know that “hacer” means “to do”. But it also means much, much more than that. There is a lot of grammar behind it, as well as all of the different shades of meaning. Typically, more common verbs such as these will have a very large amount of meanings – if you don’t believe me, search for some of the top ten verbs listed above and look at the definitions. The reverse is also true – the less frequent the verb, the more specific the definition of it is. How about hacinar, for example? Just one, easy translation! It’s clear then, that some of the most popular words in Spanish are also some of the hardest to really understand. These words have lots of different meanings, uses, and using a lot of them correctly involves understanding the grammar behind them. It’s not enough to just learn the word and hope you can use it right. If we took the top 1,000 words by frequency of Spanish and rote learnt them, I don’t think we would be able to use them properly, or speak Spanish at all well. What is Spanish vocabulary, then? My advice is simple: Don’t take a quantitative approach to vocabulary. Just because you’ve learnt 1,000 Spanish words doesn’t mean you know them – there’s probably more to know about those first 1,000 words than there is in the next 10,000. Being able to use those words means knowing how they fit together, when to use them, and knowing the different uses of those words. It’s a common temptation to take a “numbers approach” to vocabulary, as seen by the popularity of books of vocabulary lists. On the other hand, it can be useful to learn a large volume of words. Imagine you’ve learnt 2,000 words. You probably won’t be able to use all of them, but it will open the door a little wider for comprehension, and lead to more vocabulary acquisition. You’ll be aware of those words, and while you only start with a limited understanding of their uses, meanings, and contexts, you’ll grow to understand how to use them more and more as you see them around. What does a word mean? One of the best ways to tell the meaning of a word is from its context – the words that surround it. 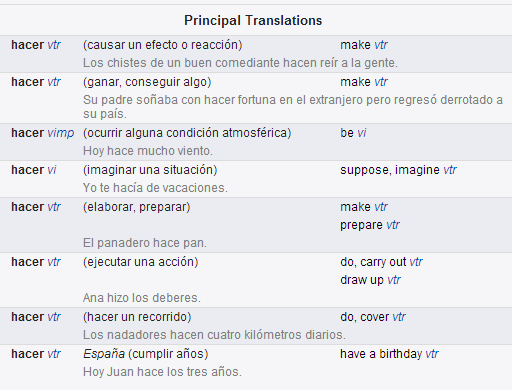 So, a good way of doing that of learning the various meanings of a word is to learn Spanish phrases. 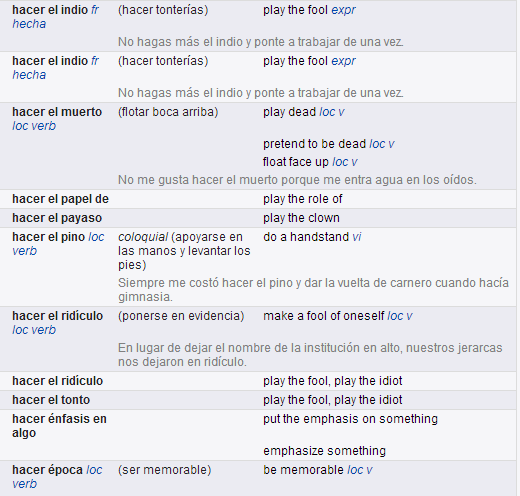 If you learn, for example, 15 phrases using the word “hacer” (post to follow soon! ), you’ll expand your knowledge of that verb, as well as learn some useful communicative nugget. Also, don’t be fooled by thinking that because you’ve memorised a word you truly know it. Language is so much richer than that. Perhaps it’s more accurate to say that when you first memorise a word, you begin a relationship with that word, and over time, hopefully you’ll get to know it better! You make good and true points but one has to start somewhere. I prefer going with the the most common words at least somewhat in order of commonality. Once a person has some fluency, he or she will continue to broaden their understanding of the most common words and acquire additional vocabulary through conversation and reading. Until some basic skill is gained, a person is blocked from learning in the most natural ways–listening, conversing and reading. Why denigrate frequency lists? No one is stupid enough not to know and understand that common words are rich with semantic content in any language. Pointless article. You clearly haven’t read the article. I say that alongside taking a quantitative approach to vocabulary (ie, frequency lists), we need to also take a qualitative approach. Yes, it’s useful to start somewhere, with common words found at the top of frequency lists, but powering from top to bottom of a vocabulary list to try to “learn more words” isn’t going to help in the long run. Pointless comment. Excellent response Rob! I suspect “lolu” is some depressed individual with some warped desire to simply offend and not add anything constructive to a discussion. Thank you for all that you and Lis do for us learners including writing this thought-provoking article.